The Divine Service is the center of our life of faith in Christ. It is celebrated every Sunday at 9:00 a.m. The Sacrament of the Altar is celebrated on odd Sundays of the month and festival days. 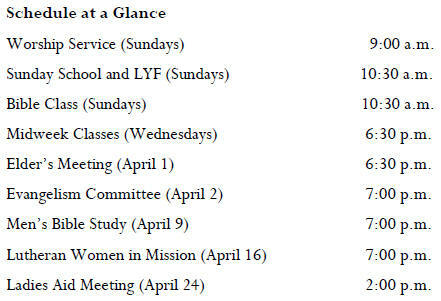 Wednesday evening Services are scheduled during selected portions of the year, as well as the Advent and Lenten seasons. March 1, 2019 - Ripping cloth. Clinking coins. Tramping feet. These are just a few of the sounds of the passion of our Lord Jesus Christ. For the midweek services of Lent—from Ash Wednesday through Good Friday—we will follow the passion our Lord through sounds and the stories they tell. Jesus goes to Jerusalem and to Calvary to give His life as a ransom for our sins. By His death we are saved. Join us for these services on Wednesdays at 10:30 a.m. or 7:30 p.m. May the Lord grant us to grow in faith and love in this journey with Jesus. April 14 - Palm Sunday with Communion 9:00 a.m.
April 18 - Maundy Thursday with Communion 7:00 p.m.
April 19 - Good Friday 7:00 p.m.
Sunday, February 10, 2019 - "God's Glory"
Sunday School is held after service from about 10:30 a.m. - 11:30 a.m. throughout the school year. The Sunday morning Adult Bible class continues to walk through the Gospel of Mark. The current plan will be to use three Sundays for this study and interrupt one week a month with a one session topic of interest. Please join us for our studies. Read up on Mark and come with your questions. And if you have any suggestions for topics of study or interest please let Pastor Toensing know. Catechesis means "Instruction in the Christian Faith." Catechesis begins when one inquires about membership in the Evangelical-Lutheran Church and continues in various forms throughout the life of a Christian. Those desiring membership at St. John are asked to speak with the pastor. In order to receive the Lord's Supper, instruction in the Christian faith according to the Scriptures and Luther's Small Catechism is necessary. There is no fee or obligation for instruction. Adult Bible Class, held Sundays after service in the basement. Youth Study, for high school students; meets Sundays after the service. Midweek School, for Grades 4–8 preparing to receive the Lord's Supper; meets Wednesdays during the school year from 6:30 – 7:45 p.m. in the basement. Adult Catechesis (new member instruction) contact the pastor for the current schedule or to schedule a time. The Church Office is open from 9:15 a.m. to 12:00 p.m. on Tuesday and Thursdays.